KateInHawaii's Weblog | Visuals from my neck of the woods. 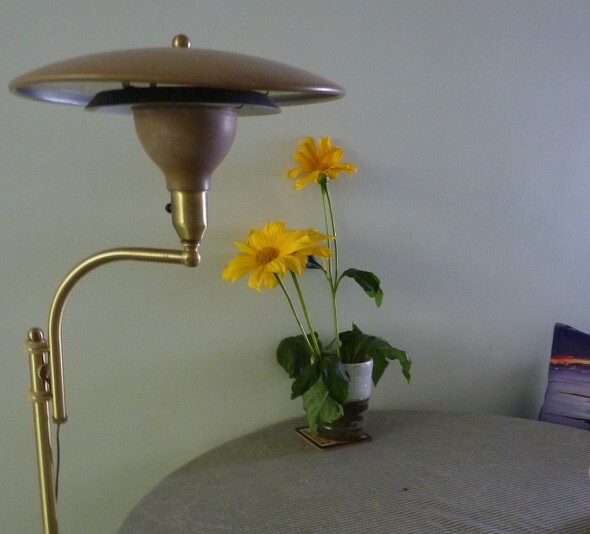 Nice to have a lovely yellow blossoms in the house. Brings the outdoors to in. Two strawberries picked on this trip. Note the young taro plant in the background. Most plants need 4 to 6″ of soil for growing (‘cept like carrots); no oxygen when you go below a foot. Compost worms eat your fruit and vege scraps. Tiller worms are plowers. Typical soil mixes gardeners can purchase from O. G., or make themselves is 1/3 black cinders, 1/3 vermaculture and 1/3 coconut fiber. You don’t want to put thick mulch in garden; water won’t penetrate. O.G. uses 70% shade cloth to make raised beds of various types that they sell. It comes in colors. Raised beds keep bugs at bay. Horse manure is a very good fertilizer. By state law it must be aired for 90 days for above ground plants; 120 days for plants that fruit on the ground. Solid stain is a good lumber protectorate, keeping borax in and bugs out, especially in pine lumber. Follow-up on “Soil Soup”, “Square Foot Garden”, Body & Soil Kipahulu Tour of 4 private farms; $115. Jan 15-16 Kula Farm workshop. 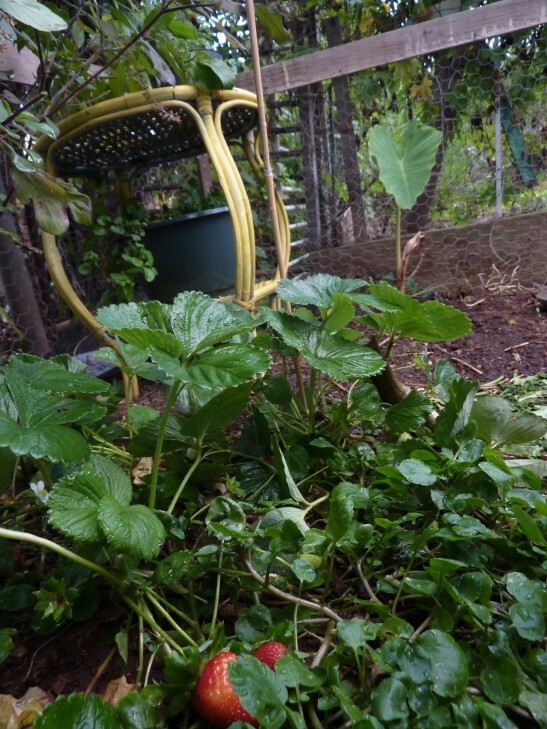 Oct. 21, ’09 – As visitor and plant starter Pamela noted, Lilikoi have started. So, now what we have eaten from the garden are a couple of varieties of tomatoes, some of lettuce, a cucumber, purple bell pepper (Mouse has eaten all), a variety of watercress, mint, holy basil, lemongrass, basil and soon lilikoi! A few Marigolds have been picked for home display. October 7, 2009 – Took a new P&S video of growing and added plants. Growing is happening almost before my eyes, so we have to get this up for posterity :). Purchased a few dollar & something plants from Home Depot today, and on Monday, finished attaching the upper deck of (green furnished by Doug) wire on the fence perimeter. So there are updates that highlight the progress! 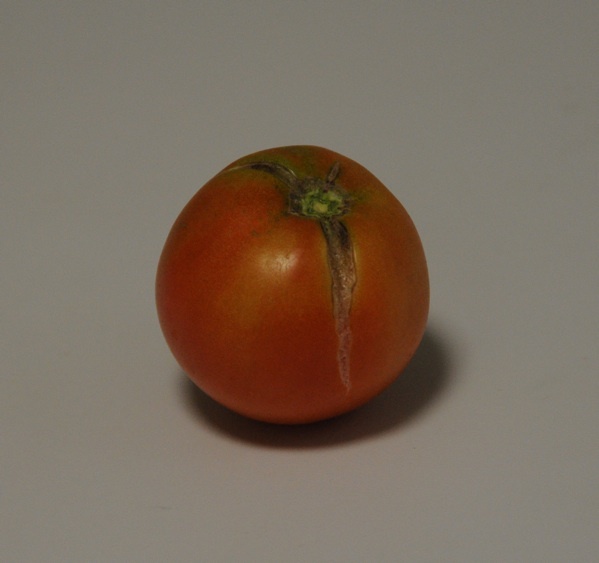 Saturday, 10/3/09 – Today I harvested the 1st BIG tomato of 3 currently ripening. Consumed a few of the smaller variety—which I’ve shared with Mouse the guinea pig— but tonight I added this larger tomato to my fried rice meal: Brown rice, red onion, green onion, lots of ginger, garlic, said tomato, part of a carrot, cabbage, and tamari to taste. Made a meal for dinner and lunch the next day. The green onion roots were saved for planting. Also today, brother Doug brought by a great piece of green wire fencing that will help keep the lilikoi plant inside Plot 63’s perimeter. This lilikoi, started by Pamela, is growing so quickly, it has taken over the diamond head side fence, and is now starting to creep onto the two mauka / makai sides. One rule of the community gardens is you can’t have your plants intruding onto your neighbors’ spaces. Lilikoi tentacles have needed trimming back from outside the fence so as not to intrude into Fred, the neighbor’s, garden. (He’s trying to keep his bitter melon from attaching itself to my lilikoi. :). All this quick, healthy growing requires cooperative vigilance.